Do you want a beautiful beginning and a happy ending to your vacation story? When your New Orleans vacations are set in a timeshare resale or rental at Hotel Storyville, you’ll describe every vacation or holiday spent there as a “happily ever after” experience. Located only a few blocks from the famous French Quarter of New Orleans, this quaint, boutique-style resort has a limited number of one and one-and-a-half bedroom suites. Though the excitement and entertainment of Bourbon and Canal Streets are only minutes away, the time you spend at the resort will be a peaceful oasis, rich in Old World charm. Sprawling resorts can have much to offer, but sometimes you want to break out of your routine, enjoy an authentic experience, and feel as if you are part of the community in which you vacation. Your decision to buy a timeshare resale at the Hotel Storyville makes this possible. And because you are buying (or renting) your timeshare directly from the current owner, you’ll also be taking advantage of the best prices available in vacation ownership accommodations. Step back in time at the Hotel Storyville, with its historic French Quarter styling and its romantic garden courtyard. Personally maintained and managed for more than a decade by Barbara the Innkeeper, this has the ambiance of a Bed and Breakfast resort (food service is not available on property), paired with the privacy of an exclusive timeshare property. 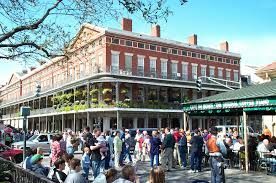 Although all units have a full or partial kitchen, when you visit New Orleans, renowned for its exceptional dining and southern cooking, and both French-inspired and coastal favorites, you may find the local restaurants, bistros, and cafés impossible to resist. Each room at this resort is distinctively decorated, themed to reflect the Innkeeper’s love of the beach and the property’s Old South architecture. Expect comfortable bedding, king or queen size beds, sleeper sofas in some units, and a private bath. Floor plans include studio units, one-bedroom plans, one-and-a-half bedroom plans, and a two-bedroom unit that accommodates up to five people. Other features that owners appreciate are the sub-tropical garden with gazebo, convenient walking distance to many New Orleans landmarks, and easy access to public transportation. Contact Hotel Storyville Specialist Today!